Onformative is a design studio founded by Julia Laub and Cedric Kiefer in 2010. The studio specialises in generative design covering various types of media and topics. At the intersection of technology, design and emotion, Onformative develop innovative, cross-media solutions for their customers in the domains of culture, education and technology. Onformative is one of the great guest to talk at the first edition of Alpha-ville EXCHANGE next 17th January 2014 at Rich Mix Cinema and Arts Centre in London. Julia and Cedric have been asked to talk about their practice, influences and recent/ in progress works at the event. They are going to illustrate how they move across the commercial, artistic and sometimes educational sectors and how they use collaboration and exchange of knowledge to produce works and projects. 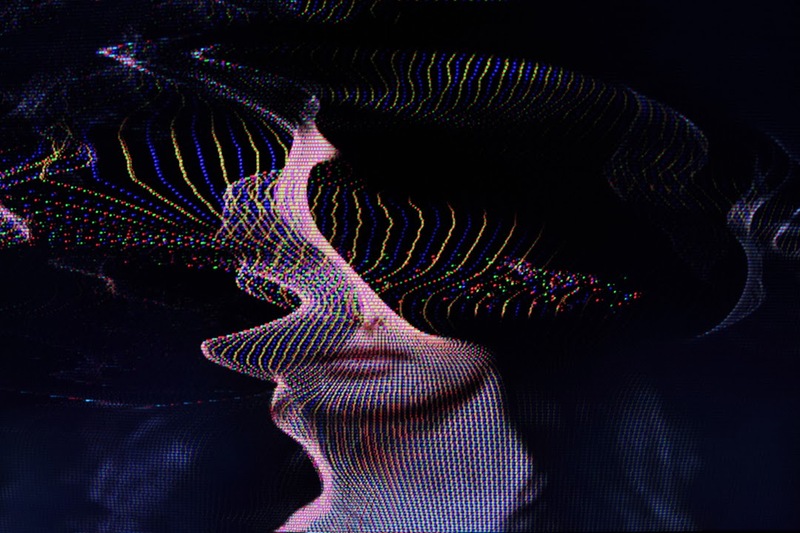 "The basic idea of the project is built upon the consideration of creating a moving sound sculpture from the recorded motion data of a real person. For our work we asked Laura Keil a berlin based dancer to interpret a musical piece – Kreukeltape by Machinefabriek – as closely as possible with the movement of her own body. She was recorded by three depth cameras (Kinect), in which the intersection of the images was later put together to a three-dimensional volume (3d point cloud), doing so we were able to use the collected data throughout the further process. The three-dimensional image allowed us a completely free handling of the digital camera, without limitations of the perspective. The camera also reacts to the sound and supports the physical imitation of the musical piece by the performer. 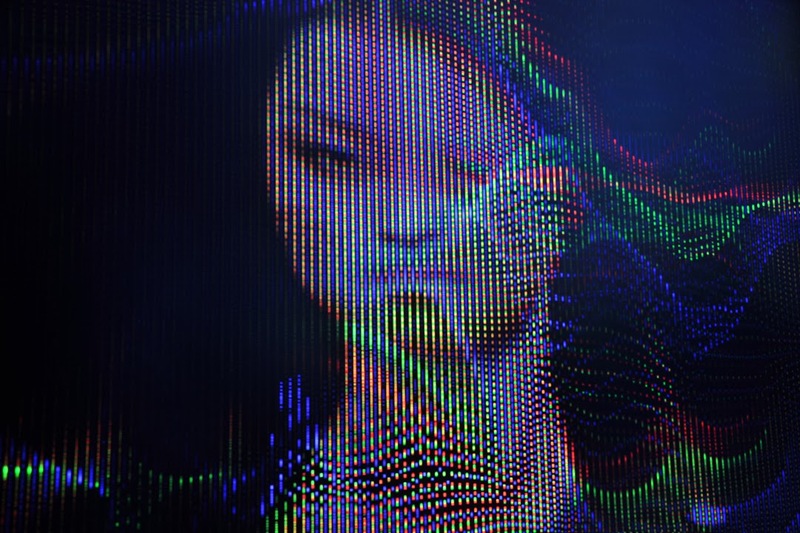 She moves to a noise field, where a simple modification of the random seed can consistently create new versions of the video, each offering a different composition of the recorded performance. 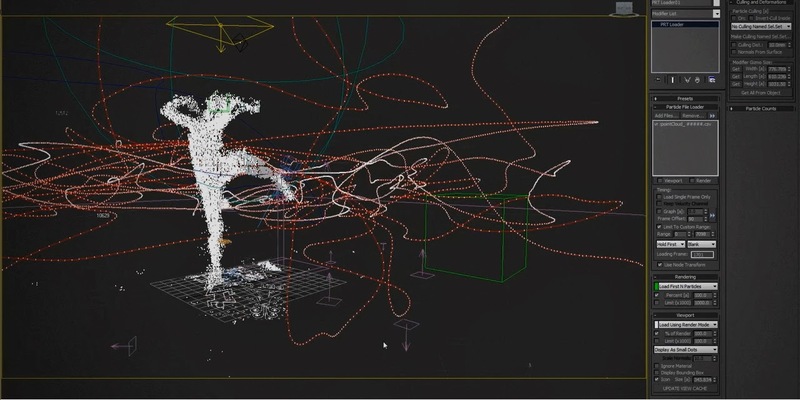 The multi-dimensionality of the sound sculpture is already contained in every movement of the dancer, as the camera footage allows any imaginable perspective." "Similar to painting, a single point appears to be still very abstract, but the more points are connected to each other, the more complex and concrete the image seems. The more perfect and complex the “alternative worlds” we project and the closer together their point elements, the more tangible they become. A digital body, consisting of 22 000 points, thus seems so real that it comes to life again. Project collaboration with Daniel Franke. "This project experiments with illusion and perception on various levels. 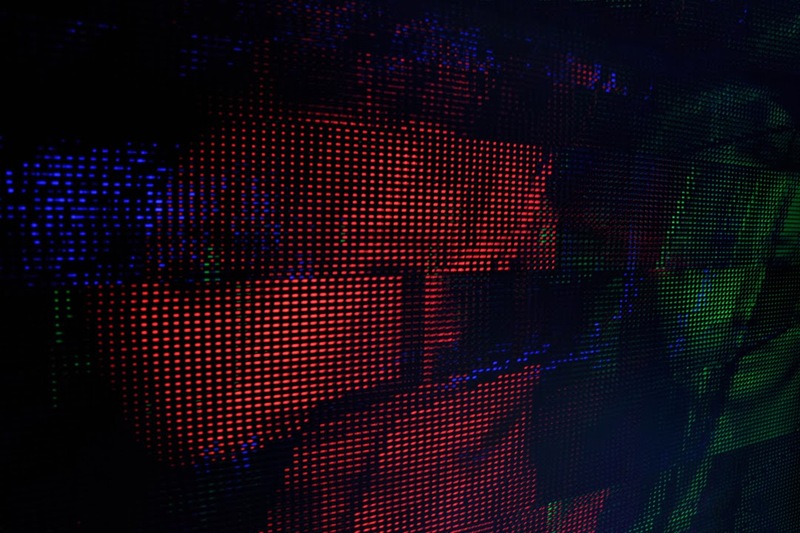 The classic LED screen as a medium was simulated and disintegrated by the creation of a pixel-like optic using simple projection rather than the entire image’s being comprised of individual points of light. If one examines the idea of perception more closely, especially individual perception – which differs from individual to individual – then a second consideration arises in regard to »fragments of RGB«. "Probably everybody has experienced how complicated it might be to work with video in Processing, especially if you want to import a lot of different videos for testing purposes. You need to take care of the resolution, the codec and the size of the video file, in order to make it suit your specific requirements. Furthermore you might not even have access to a video or image file at all and just want to test some media in your sketch. That’s where the Processing ScreenCapturer library comes in quite handy." "As an experiment, we wanted to investigate in the different visual forms, the process of sorting can have. Each sorting algorithm reveals its particular strategy as a unique pattern. We took a row of pixels of a photograph and sorted the pixels by their color value. Since Processings color object is actually a number, they are perfect to be ordered. It worked well with grays, but revealed an unintuitive sorting of the colors. While they are ordered mathematically, one expects the gradients to be different. Alpha-ville EXCHANGE 1 features a Day Programme packed with presentations, talks and social events alongside a music programme in the evening for attendees to network and enjoy. Work will be presented across: motion graphics, graphic design, illustration, interaction design, generative design, digital and software art, mixed media art, data visualisation and more. Tickets available here.